Congratulations to all successful passers of the Mechanical Engineer board exam, most specially to the topnotchers who garnered the ten (10) highest places in the March 2015 Mechanical Engineer Licensure Examination. The complete set of passers for the Mechanical Engineer Board Exam (March 2015) can now be viewed HERE. Here are the successful Top 10 Passers of the Mechanical Engineer Board Exam. 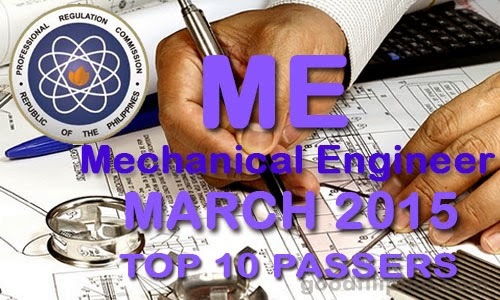 Comments or suggestions about "Top 10 Passers of March 2015 Mechanical Engineer Board Exam" is important to us, you may share it by using the comment box below.